Switzerland is renowned for its exceptional chocolate. 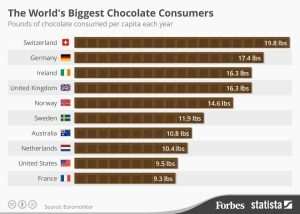 From all of those prism-shaped Toblerone bars in airport duty-free shops across the world to the more local Cailler and Frey varieties, it comes as little surprise that Swiss people consume the most chocolate per capita of any country worldwide. Every year, the average Swiss person eats just under 20 lbs of chocolate. Neighboring Germany is also a nation of chocoholics with annual consumption per capita amounting to 17.4 lbs. The Irish also have a sweet tooth and they come joint third with the United Kingdom with 16.3 lbs per year. The United States cannot compete with Europe in the chocolate consumption league and it comes in ninth overall – the average American eats about 9.5 lbs of chocolate each year. ← Man finds pearl in his oyster plate in restaurant!